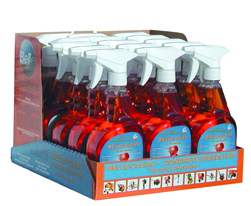 Belle-Clean is an alternative to liquid acid with no odours or fumes. It attacks the Portland in cement, completely dissolving the hardened cement to a mushy substance that rinses away with cold water. Can be used to remove cured cement, concrete, mortar, grout or render off any surface. Does not contain Phosphoric Acid or Hydrochloric Acid. Non corrosive and non hazardous to equipment. 100 per cent biodegradable. 15 x 650ml bottles.